This article explores the needs of newcomer youth served by a social service agency providing refugee foster care services. All newcomer youth served have one of the following forms of immigration relief; refugee, Special Immigrant Juvenile Status (SIJS), victim of human trafficking (T-visa), or asylum. The purpose of this study was to explore the perceptions of staff regarding the ways in which mental health, education, legal assistance, and employment needs might differ by immigration status for the newcomer youth served. Findings demonstrate that educational needs were similar, but that newcomer youth without permanent resident status reported more signs of depression or anxiety. Additionally, newcomer youth had a variety of migration-related experiences that impacted their legal needs, and staff felt the legal process lacked some clarity. Staff felt that employment needs were prioritized by newcomer youth with SIJS. 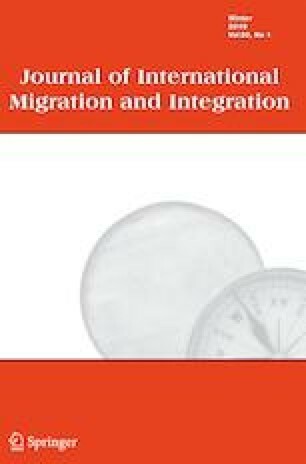 Findings contribute to a scholarly understanding of the effects of the complex unaccompanied minor immigration system, and have implications for the application of a systems framework (Maton et al. in American Journal of Community Psychology, 38, 1–7, 2006; Tseng and Seidman in American Journal of Community Psychology, 39, 217–228, 2007) in youth social settings. This work was funded by a grant from the Multicultural Research Consortium in the Department of Psychology at Michigan State University. Cuervo, S. & Ogunyoku, T. (2012). The changing face of the Unaccompanied Alien Child: A portrait of foreign-born children in federal foster care and how to best meet their needs (USCCB report). Retrieved from USCCB website: http://www.usccb.org/about/children-and-migration/unaccompanied-refugee-minor-program/upload/A-Portrait-of-Foreign-Born-Children-in-Federal-Foster-Care-and-How-to-Best-Meet-Their-Needs_USCCB-December-2012.pdf. Accessed 3 March 2014. Drevlow, E. & Siman, P. (2012). Improving access: Immigration relief for children in federal foster care before and after the Trafficking Victims Protection Reauthorization Act of 2008. (USCCB report). Retrieved from USCCB website: http://www.usccb.org/about/children-and-migration/unaccompanied-refugee-minor-program/upload/Immigration-Relief-for-Children-in-Federal-Foster-Care-Before-and-After-TVPRA-2008_USCCB-December-2012.pdf. Accessed 11 Aug 2016. Lee, J. S. (2012). Unaccompanied refugee minors and their strategies to navigate a new world: A grounded theory (Doctoral dissertation, Virginia Commonwealth University). Retrieved from https://digarchive.library.vcu.edu/handle/10156/3862. Accessed 4 March 2014. Office of Refugee Resettlement. (2013). About unaccompanied refugee minors. Retrieved from http://www.acf.hhs.gov/programs/orr/programs/urm/about. Accessed 31 March 2013. Office of Refugee Resettlement. (2016a). ORR Unaccompanied Children Fact Sheet. Retrieved from https://www.acf.hhs.gov/sites/default/files/orr/orr_uc_updated_fact_sheet_1416.pdf. Accessed 15 Jan 2016. Office of Refugee Resettlement. (2016b). Facts and Data. Retrieved from http://www.acf.hhs.gov/programs/orr/about/ucs/facts-and-data. Accessed 18 May 2016. Pierce, S. (2015). Unaccompanied child migrants in U.S. communities, immigration court, and schools. (Issue brief from Migration Policy Institute). Retrieved from Migration Policy Institute website: http://www.migrationpolicy.org/research/unaccompanied-child-migrants-us-communities-immigration-court-and-schools. Accessed 1 Dec 2015. Trafficking Victims Protection Reauthorization Act [TVPRA]. (2008). H.R. 7311 — 110th Congress: William Wilberforce Trafficking Victims Protection Reauthorization Act of 2008. Retrieved from https://www.govtrack.us/congress/bills/110/hr7311. UNHCR. (2011). Convention and protocol relating to the status of refugees. (60th Anniversary Special Report.) Available from http://www.unhcr.org/4ec262df9.html. Accessed 1 June 2013.